China’s Zotye may have changed the name of their upcoming SUV from T700 to SR8, but everything else we scoffed about their Porsche Macan clone remains, with the company to debut the car at the Beijing auto show on April 25. In fact, it’s much worse than we originally thought when we first laid eyes on the SR8 last summer through some studio shots that only showed the exterior of the prototype. 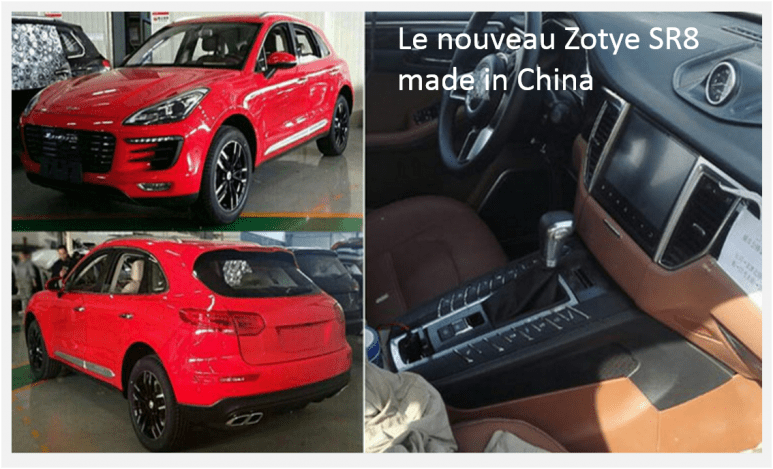 New images from China give us a first glimpse at the interior, and shockingly, Zotye audaciously ripped off the Macan’s cabin too, from the steering wheel design and trim, to the multi-button lower center console and even the clock on top of the dash! Not that we should be surprised, but until now, Chinese clones usually refrained from copying the designs of both the interior and exterior from the same car. Apparently, the absence of any meaningful response from Western carmakers has led companies like Zotye to become even more brazen with their plagiarism. It’s not that Western companies haven’t repeatedly tried to protect their work in China, but that they’ve been largely and alarmingly unsuccessful in enforcing any intellectual property rights. Last year, when Porsche was asked about a report from Germany saying it may take legal action against Zotye Automobile, the Stuttgart carmaker declined to comment.